I had a discussion the other day with a bunch of Googlers from Google Outreach about a research project I'm planning. Its about GEarth tours and in the course of kicking around the idea we came to the joint conclusion that tours had a great capacity for showing people material and then getting them to explore on their own informed by what you've just shown them. I liked the idea so as an experiment (excuse the balloon formatting and lack of polish) I've produced an example on the back of something else I'm working on. It takes you through some educational material about interpreting landscapes and then gives you a constrained task. A key part of the presentation is the use of pauses within the tour. By using the plugin I can turn off all the unwanted layers such as roads, boundaries and just leave the terrain on. This works well for this particular content. Audio would work a lot better here than the text, there are specific reasons why I've not used audio that I won't go into. Getting students to do activities is a well proven technique of improving learning. When a GEarth tour is paused you can fly anywhere to explore, clicking play again takes you back to where you left the tour and then the tour continues. This ability is what I use in this experiment to provide an activity. A nice extension of the idea would be to pause the tour showing students several placemarks which they have to navigate around and then choose between the placemarks. Clicking the placemark would tell them if they're wrong or right. For example: you could explain the basics of where to find groundwater in Africa using a GEarth tour then provide some placemarks that represent sample borehole sites . 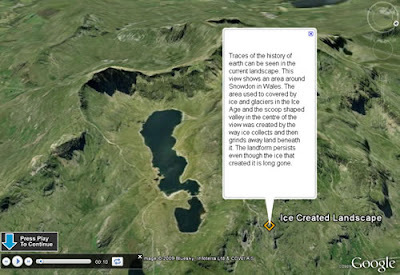 Clicking the placemarks would give them feedback on whether they'd selected the best site to drill to find groundwater.